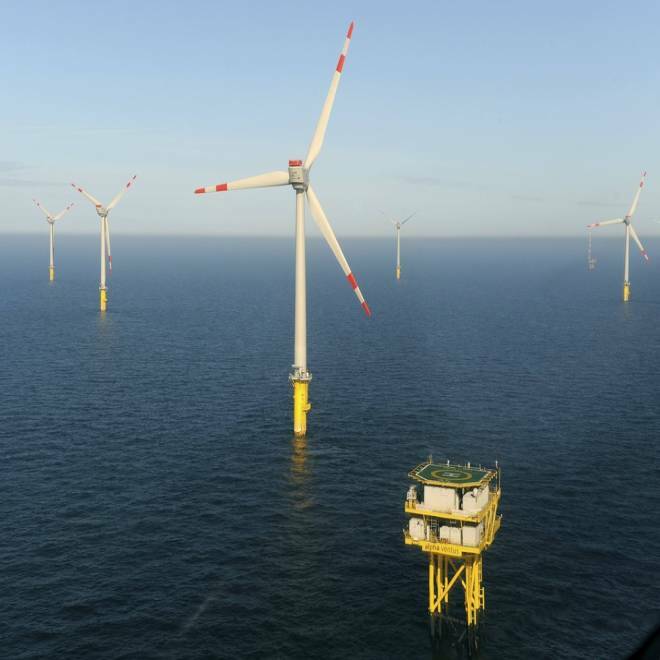 Offshore wind turbines are seen in Germany's North Sea, along with a service platform that doubles as a transformer sending electricity to the mainland. Germany and Denmark are leaders in the offshore wind industry. Placing wind turbines off the East Coast could meet the entire demand for electricity from Florida to Maine, according to engineering experts at Stanford University. It would require 144,000 offshore turbines standing 270 feet tall — not one of which exists since proposals have stalled due to controversy and costs. But the analysis shows it's doable and where the best locations are, says study co-author Mark Jacobson, a Stanford professor of civil and environmental engineering. The team is not advocating for an "all wind" approach, saying it'd be foolish to put all of one's energy eggs in a single basket, but they do think it could reach up to 50 percent. Today the U.S. gets about 4 percent of its electricity from wind, but only via turbines on land. 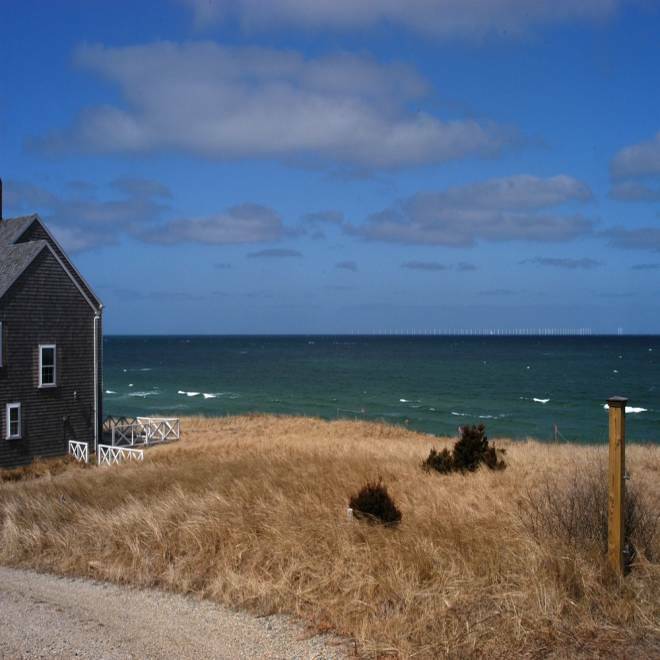 The first large-scale offshore wind farm was proposed in 2001 off Massachusetts' Nantucket Island. But vocal opposition, including from political heavyweights like the Kennedy family, are seeking to block the $2.6 billion Cape Wind project, arguing the 130 massive turbines would mar views and endanger boat and air traffic. "The question that I would first ask" critics, Jacobson told NBC News, "is would they rather have a coal or natural power gas plant in their neighborhood, which affects their health and that of their children as well as their quality of life and property values, or an innocuous turbine that they could barely see during those times when they were actually looking offshore." For the analysis published in the journal Wind Energy, Jacobson's team created a computer model with 144,000 wind turbines that produce 5 megawatts of electricity each, similar to the turbines installed off Denmark and Germany. They then plugged in historical wind speed data to come up with estimates. 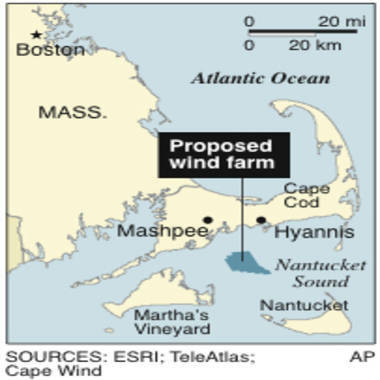 Map shows site of proposed wind farm near Cape Cod. They also favored places with lower hurricane risk, essentially excluding any area south of Virginia. The best locations are "way out of sight" from coastlines, Jacobson said, and the worst-case scenarios would be distant views of turbines about the size of one's extended thumb. "The only place with significant opposition to offshore wind that I am aware of has been in Nantucket," he added. "There are dozens of other proposals in the U.S. that have not faced nearly the same extent of opposition." Cape Wind does have federal approval, as well as support from major national environmental groups, and hopes to begin building turbines next year. But opposition groups like Alliance to Protect Nantucket Sound are still battling the project in court and before federal agencies. Cape Wind created this simulated photo to show what it says would be the view of its wind farm from Nantucket Island. The distance out to the turbines, seen as white dots on the horizon, is 13 miles. A further limitation is cost. Cape Wind, for one, is still working on financing, and cheaper natural gas has taken some of the shine off wind, at least in investors' eyes. Moreover, installation offshore currently costs two to three times more than land-based turbines. Jacobson's team says the new study will help locate the most economically feasible sites, particularly around New York and Boston when peak demand for electricity can send prices soaring. "Connecting the power to the grid would be technically as easy as laying a cable in the sand and hooking it directly into the grid without the need to build often controversial transmission lines on the land," said Mike Dvorak, the principle author of the study. He also noted that offshore wind has an advantage over land-based wind turbines. "People mistakenly think that wind energy is not useful because output from most land-based turbines peaks in the late evening/early morning, when electricity demand is low," Dvorak said. "The real value of offshore wind energy is that it often peaks when we need the most electricity — during the middle of the day." Nov. 5, 2007: NBC Cameraman Brian Prentke and Soundman David Moodie took a two-hour boat trip just to film the Middelgrunden off shore wind farm in Denmark. Denmark currently gets 20 percent of its electricity from 5500 offshore and onshore wind turbines. Besides reducing pollution and increasing domestic energy resources, wind has a key advantage over natural gas or coal, Jacobson notes. That's price stability. "There's zero fuel costs once they're in the water," he said. "Coal and gas are depletable resources, so their cost will inevitably go up over time. The cost of wind energy will remain stable, and the wind resource is infinite." 'Free money' for Conn. fishermen amid eco-disaster?